Keep learning all winter long with these 49 best homesteading documentaries you can stream to your home. The summer is winding down and fall is upon us. We are busy harvesting from the garden and bottling up all of that garden freshness into our pantry for winter. But once all of the harvest and canning are done, the long winter comes. Of course, we have things to do in the winter: some are calving, taking care of livestock and doing regular chores. But admittedly, the homestead pace becomes a little slower during the winter months. Depending on where you live, you may still have a couple of months (or more) until winter hits. So, what can you do around the homestead in the winter? Learn! Learn a new skill or theory of how to do things. Research a new idea or strategy. So today we are going to talk about homesteading documentaries that you can watch on streaming services such as Netflix or Amazon Prime. Now, if you don’t have very fast internet where you are, this may be harder. Netflix does have a dvd service, but not everything available digitally is available on disc and vice versa. The list below are the documentaries available on these networks as of July, 2018. Now before I get mean emails or comments, let me just clarify. I don’t expect you to sit around all winter and watch tv. I understand that you have better things to do with your time. But since it gets dark early in the winter and you may have less to do then, these documentaries can help you learn more about food, medicine, farming and other homesteading topics you might be interested in. So let’s get started! *** I have not watched all of these homesteading documentaries. I will give a review of the one’s I have watched to let you know my opinion on them. I also link each movie with a website that has more information on that title. For a small monthly fee, you can stream many tv shows and movies (including these homesteading documentaries) onto your tv and watch as many as you want. Cost: Netflix plans start at $7.99 per month. Forks Over Knives-This is a great movie, but I still don’t want to go vegan. It did make me realize that we eat too much meat and not the good kinds. That’s why homesteading is so important! 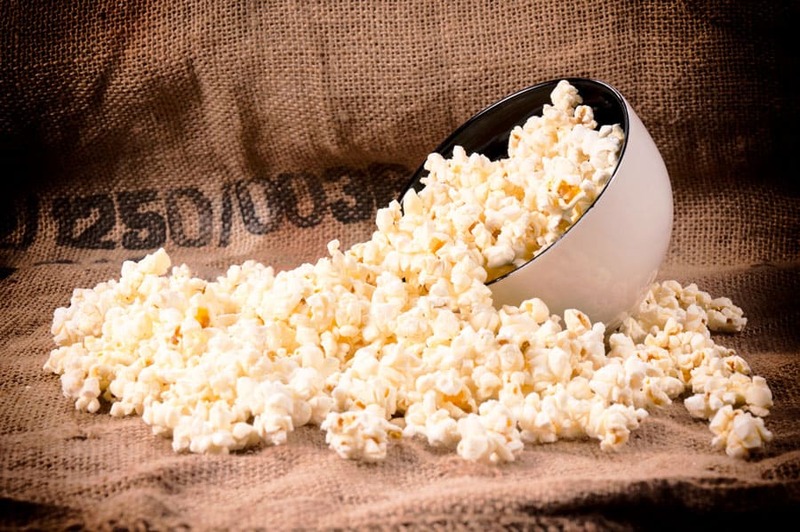 Food Inc– This movie shows how messed up our food system is and what we can do about it. Homesteading anyone? Fat, Sick & Nearly Dead-Joe Cross was having health and weight problems. He took an extreme approach to dieting and turned to juicing to lose weight. See what happened after several months. . .
Sustainable-A movie about how to make the switch to organic farming and how to make it profitable. This service is part of being an Amazon Prime Customer. You can stream some tv shows and movies for free and others you can buy to stream into your home. You also get other perks for being an Amazon Prime member such as free music, books and shipping on included products. Cost: $99 per year. If you would like to see all of the perks that go with Amazon Prime, check it out here (affiliate link). Food Matters-This movie discusses the health industry and why they get rich while we get sick on the Standard American Diet. I have watched several of these movies, but I plan on watching more this winter too. We can always learn new things from new points of view. These movies help us see what is going on in the world around us. Even if we don’t agree with their conclusions, they can help us better identify why we do the things we do, including homesteading. Want to remember this? 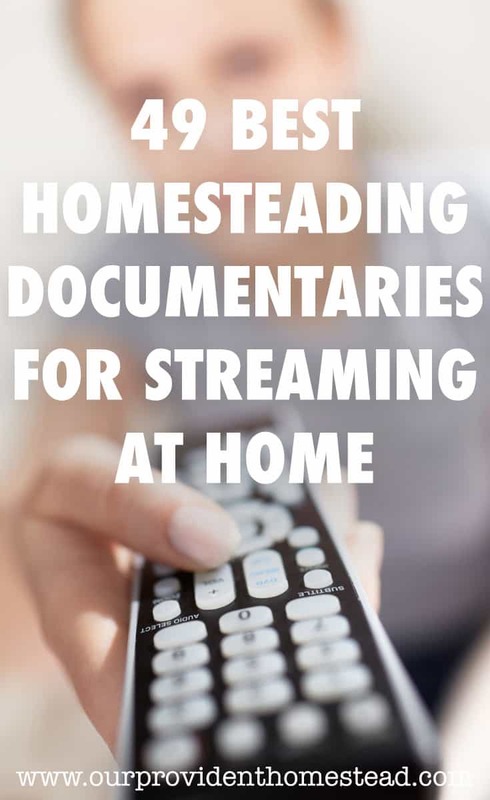 Save the 49 Best Homesteading Documentaries for Streaming At Home pin to your favorite homesteading Pinterest Board! Have you watched any of these movies? What did you think? Please let us know in the comments below. And if you found this post helpful, please share. Thanks! Food Inc and Supersize Me were hugely influential for me. I stopped eating McDonald’s because of Supersize Me and became a vegetarian (for just a summer) because of Food Inc. I’m now married to a hunter and feel differently about consuming meat products (although we don’t hunt our own food right now, it’s a plan for the future when we hit early retirement). It was great to meet you at Activate and I look forward to checking out your blog more! Thanks so much! Yes, it is important to know where our food comes from! It was good to meet you too. Thanks for stopping by! Thanks for sharing the best homesteading documentaries with us. Thank you for this list! I’ve seen a few of these on Netflix. I found Living On One Dollar fascinating. These young men showed a glimpse of what it was like to live in a country where the wage is less than $1 a day, and what that means for your survival and every aspect of your life. I highly recommend it! that sounds like a good one! thanks for stopping by!